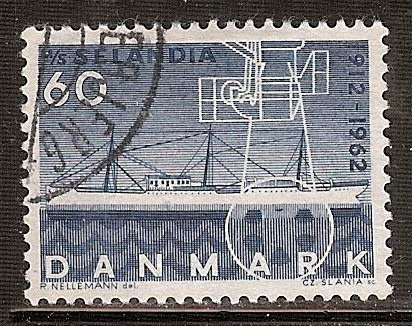 On June 14, 1962 Denmark issued a stamp to commemorate the 50th anniversary of the Motor Ship Selandia. The Selandia is often referred to as the the worlds first diesel powered ship. Constructed by Burmeister & Wain in Copenhagen the Selandia was ordered by the East Asiatic Company. She was launched on November 4, 1911 and completed during February 1912. The Selandia was 370' long with a beam (width) of 53'. Weighing in at 6,800 tons DWT (dead weight). Her 2 M.A.N., 8 cylinder four cycle diesel engines provide 1,250 hp each providing the Selandia 12 knots of speed. Constructed to serve in both cargo and passenger service the Selandia had 20 luxurious first class cabins along with many single berth cabins with a washroom for every two cabins. All cabins were described as very ample or of exceptional size. She sailed between Scandanavia, Genoa and Bangkok and was eventually sold to Panama in 1936. Where she was renamed Norseman and then as the Tornator in 1940. In January 1942 she ran aground off the coast of Omaisaka, Japan and became a total loss. The Selandia was a ship that changed the future of shipping and marine technology.